Former Prime Minister and Chairman of UCPN (Maoist) Pusupa Kamal Dahal, Prachanda launched a new tourist trekking trail, giving visitors the chance to retrace the guerrillas’ footsteps on October 2. The Guerrilla Trek, a two-week to four-week hike depending on the itinerary which stretches across central and western Nepal, is designed to draw in more foreigners as the Himalayan nation seeks to rebuild an economy devastated by the 1996-2006 People’s War. I hope this will be a new chapter in Nepal’s tourism. 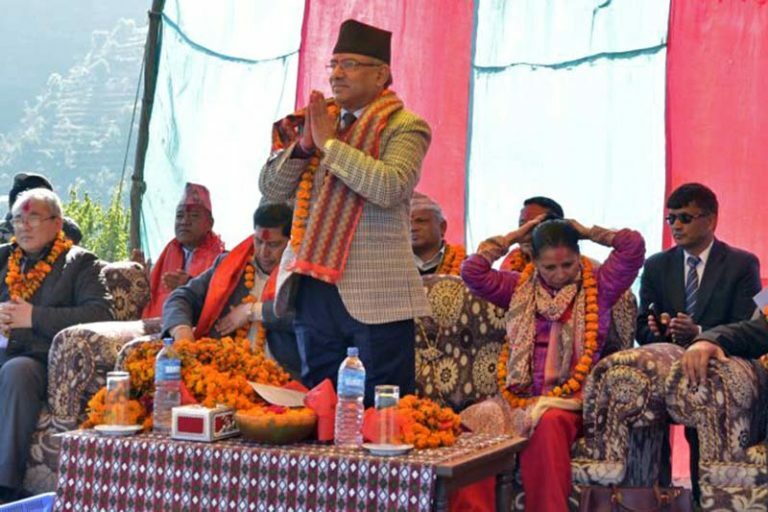 Many countries that have emerged from war have tried to capitalise on the memory of war, Maoist chairman Pushpa Kamal Dahal said. A huge political change occurred in Nepal but we cannot sustain it unless there is an economic transformation. I hope the Guerrilla Trek will play an important role. He said Guerrilla Trek has the potential of becoming a war tourism product like in Vietnam, Russia, and China. As war tourism has been promoted worldwide for economic benefit, Nepal’s Guerrilla Trek also holds the potential to grab the world’s attention. The trek passes through Nepal’s lush valleys that stand in the shadow of mountains including Dhaulagiri and through dramatic waterfalls, lakes and the country’s only hunting reserve, the organisers said. A part of the attraction is the Magar community, from which most of the guerrillas were recruited at the initial stage of war. The trek also consists of the Yarsagumba Trail and the Dhorpatan Hunting Reserve. Everest, Annapurna are famous. But if you want to take a unique route, this is the one, Alonzo Lyons, an American travel writer who trekked the route last year, told AFP. Its natural scenery is simply captivating. You also come across diverse cultures. He said trekkers would be able to see the remnants of the war and become familiar with the recent history of Nepal. The Guerrilla Trek offers a remarkable journey through the heartland of post-conflict territory. The route passes through Myagdi, Rukum, and Rolpa, spectacular districts with low population density at the epicenter of Nepal’s ten year conflict (1996 to 2006), and homeland to many revolutionaries. At one time during this period, the region had an autonomous government in Banphikot, Rukum. The trail has been divided into three sections. First section of trek is 19-day walk which starts from Pokhara meandering through Beni, Dhorpatan, Maikot, Taka, Thawang and ends at Sulichaur. The second section of trek also follows same route but gets diverted from Dhorpatan and again meets trail at Taka and follows the same route to Sulichaur. It is 14-day trek. Most arduous trek is 27-day trek which starts from Pokhara and goes to Beni, Dhorpatan and comes back to Pokhara again in 15 days. And it takes another route from Pokhara meandering through Syarpu Lake, Khalanga and meets regular trail at Taka and follows the same trail to Sulichaur. This trek goes over rugged mountains, rivers lined with lush wheat fields, caves and centuries-old villages. Best time to visit: October, November, March and Early April. The trail research is promoted by Trekking Agencies Association of Nepal, Nepal Tourism Board and the District Development Committee, Rukum, and explored by Changing Nepal and supported by Sinse Martyr Foundation and Dynamic Youth Society, Rukum. (With input from AFP and The Kathmandu Post).